Huawei apparently just can't wait to show some of the wearable tech it has in store this year. 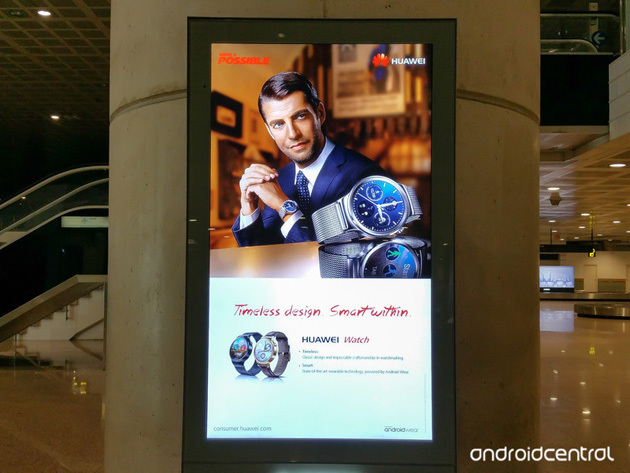 While the company isn't supposed to reveal its Mobile World Congress plans until a press event on March 1st, it has already posted both videos and airport ads revealing its first Android Wear device, the plainly-titled Huawei Watch. You won't learn a huge amount from the clips, which are loaded with stiff-sounding English ("it has to look like a watch, because a watch is a watch..." wait, what?). However, it's already clear that Huawei is aiming for the upscale crowd with a sapphire-covered circular display, custom watch faces and oodles of metal and leather. The Watch is certainly one of the better-looking smartwatches we've seen, then. The real question is whether or not it does anything special under the hood -- you'll likely get the full scoop on that very shortly.